Anionic Annulations in Organic Synthesis is a comprehensive review of the best annulations for construction of cyclic structures and their applications in the total synthesis and the synthesis of functional molecules. The annulation, another name for the ring formation with two new bonds of the ring, is a powerful tool in general organic synthesis as well as total synthesis of natural products. The reactions described in the work are particularly useful for the synthesis of polyoxygenated polycyclic compounds, including tetracyclines, angucyclines, uncialamycins, and lignans, among other compounds. Included in detail are the Hauser, Robinson, Sammes and Meyers annulations, all of which can be effectively used to construct substrates with complex molecular structures. This work provides the tools to master anionic organic chemistry, ortho-lithiation, lateral lithaition/metalation and organic selectivity issues like chemoselectivity, regioselectivity and stereoselectivity. 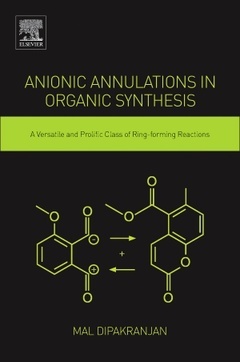 This book is a valuable resource for organic chemists, researchers and students seeking a complete and detailed understanding of anionic annulations. Dipakranjan Mal began his studies at Calcutta University, where he received 1st class B.Sc.-Hons (1972) and M.Sc. (1975) degrees. He attended the University of Missouri at Kansas City for his Ph.D. degree in 1981 on intramolecular hydrogen bonding under Professor Layton L. McCoy. After a 3-year postdoctoral stint with Professor Frank M. Hauser at Oregon Graduate Center, he joined Bose Institute, Kolkata as a lecturer in 1984. Since 1987, he has been with the department of chemistry, Indian Institute of Technology Kharagpur, where he is now a higher administrative grade professor. His research interests are focused on the development of anionic and thermal domino strategies and total synthesis of angucyclines, anthracyclines, carbazoles, furocoumarins, and phthalide natural products. His notable discoveries are i) decarboxylative [4 + 2] annulation, ii) anionic [4 + 3] annulation and iii) an olefination based on thiophthalides. He has supervised 27 doctoral students and published over 120 research publications, including two reviews in Chemical Reviews. He has developed a 40-lecture video course on “Heterocyclic Chemistry available on YouTube. He received the honor certificate of Phi Kappa Phi, U.S., in 1978. Recently, he was inducted as a Fellow of the West Bengal Academy of Science and Technology as well as Royal Society of Chemistry.